You could eat your way through the Restaurant show and never look back. In one aisle alone I counted 17 food samples. There was everything from hot dogs to flatbreads to desserts. Me? I was simply in overload heaven.There was so much food, one could put on at least a half a dozen pounds just thinking about it. The NRA attracted more than 58,000 registrants from 120 countries and if you can name 120 countries, you win! I get lost somewhere around 90. 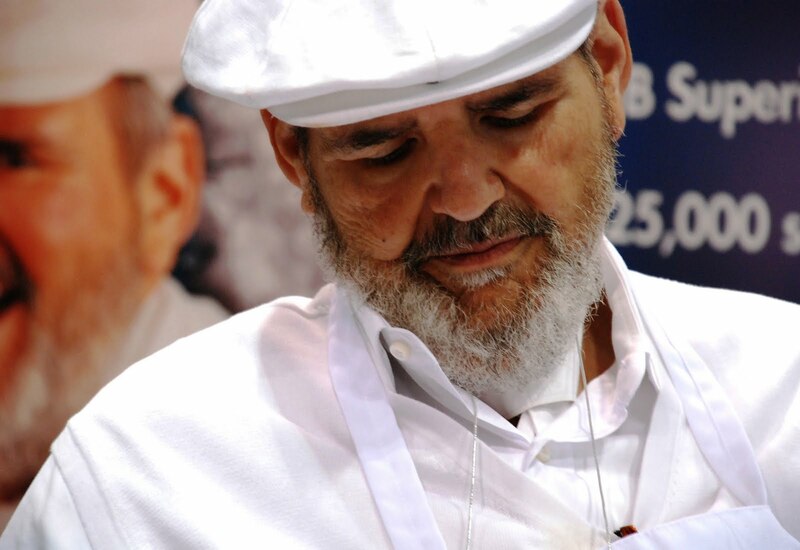 It was remarkable to have so many celebrated chefs in the same space and all of them there for the same reason you were. One could have easily stayed in the educational sessions but you would have missed out on half the fun and all of the calories. 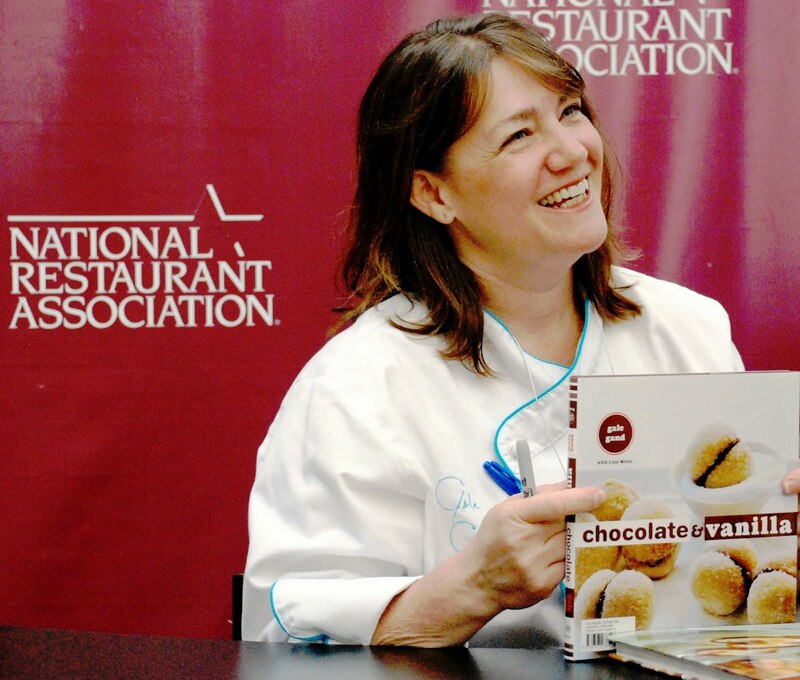 The two sessions I attended were really exceptional and I walked away with so many new ideas. Every one of the panelists gave a great perspective on social media. Get Butts in Seats for Free with Word of Mouth and Social Media. Geoff Alexander of Wow Bao, Ramond DeLeon of Domino’s Pizza and Charlie Howard of Gold Star Chili. Billy Dec of Rocket Ranch, Alpana Singh of Check Please, Steve Dolinsky – food reporter of ABC 7 and Richard Roeper – Film critic and TV Host. What I learned? Remember me – the one who posted way back when that I was not a fan of Korean food? I take it back. Bill Kim can put together anything and it will be brilliant. What was a so-so sounding Kimchi Stew with Hominy turned out to be one of my favorite foods at the show. Also, everything that I have tried at his restaurants – Urban Belly and Belly Shack – have made me a evolving fan of Korean cooking. I LOVE Ludo Lefebvre. Wife Kristine, a cancer survivor and all time good sport enjoyed the fact that so many women wanted their photo taken with the Top Chef Master with his pop-up restaurant Ludo Bites. He is a charmer and I was one of the many who fell under his magic. He also did the lead in to the book signing for Rick Bayless and picked up at least a thousand new fans in the process. 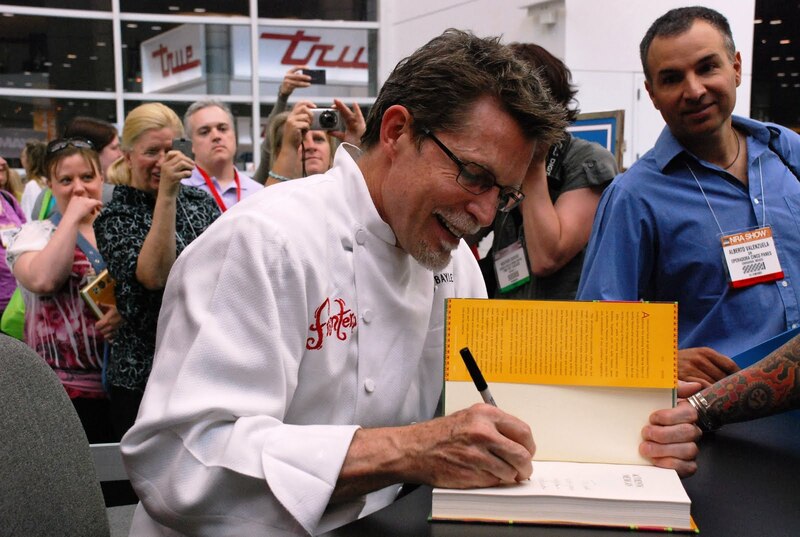 Coming off the high of a white house gig and suffering from laryngitis, Rick Bayless was a favorite once again, drawing long lines at his book signing. 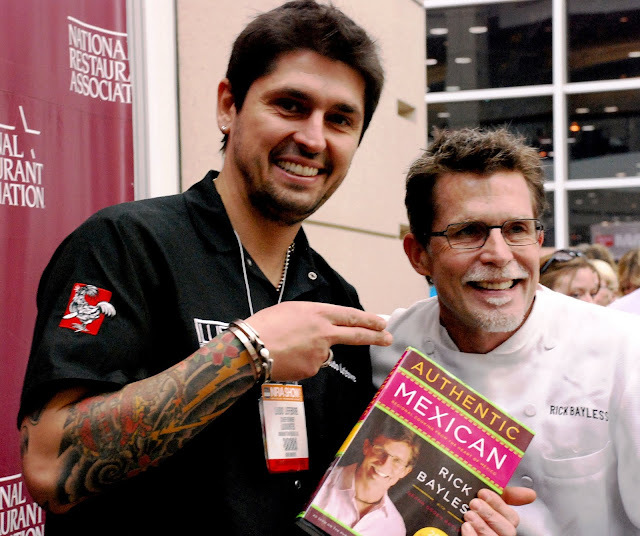 His cooking demonstration was clever and the recipe for Mochomos (defined as cooked, shredded and crisply fried meat) will be in his new book, "Fiesta at Rick's" which is being released on July 5th. In fact, all the book signings were great. Mobi Munch was the hit of the show. With street trucks the hot new ticket, the first launch was chef Ludo Lefebvre's LudoBites Fried Chicken truck in L.A.Keep a close eye on Mobi Munch as this cast will take street food to a whole new level in the next year. 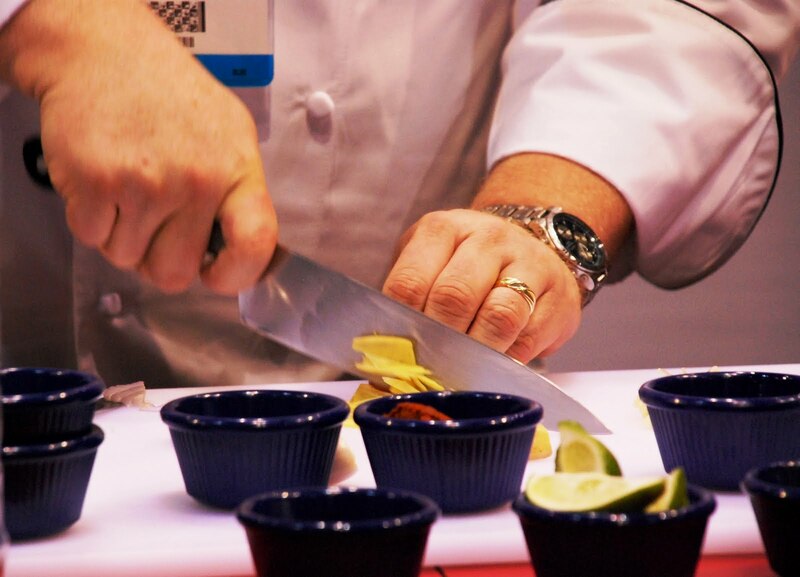 Hopefully changes in the laws in Chicago this summer will make it possible for chefs to hit the streets allowing them to cook all of the food on-site. I am a huge fan of Kevan Vetter, head chef for McCormick. 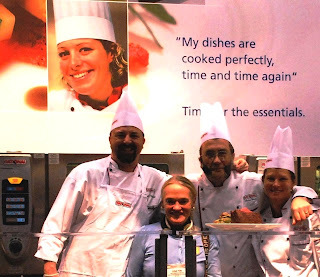 This great culinary vet put on cooking demos every day at 11AM and 2 PM and gained a whole new following...including me. 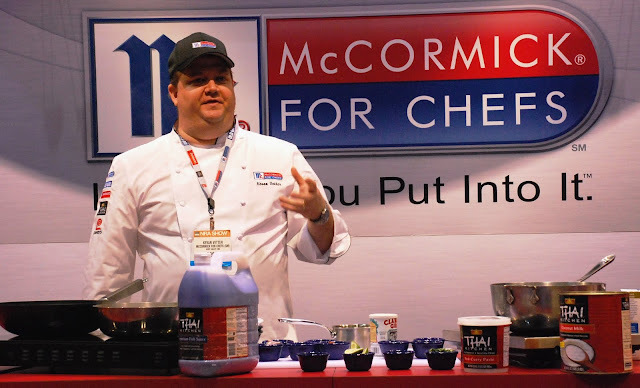 McCormick For Chefs–Food Away From Home Division is revitalizing its portfolio of five brands: McCormick Culinary, Lawry’s, OLD BAY, Zatarain’s and Thai Kitchen. 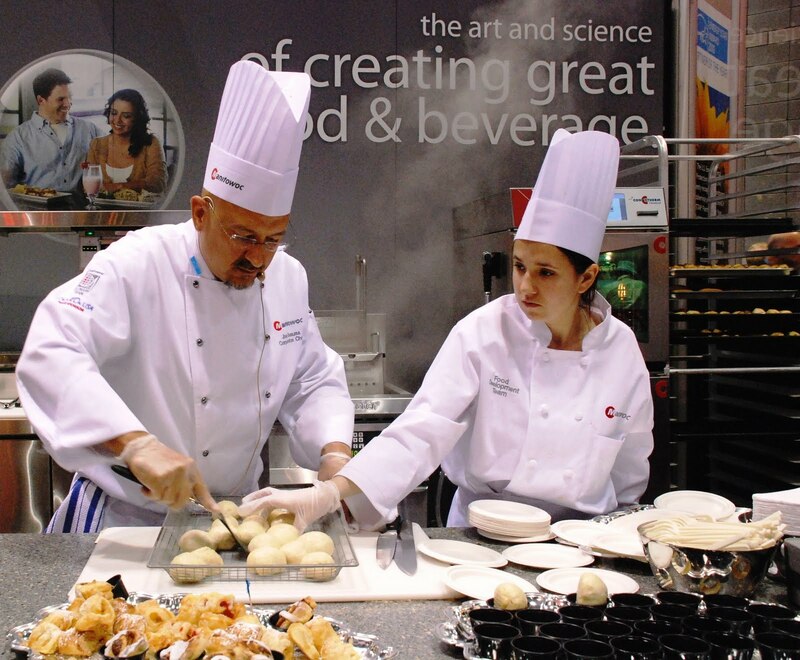 The culinary masters from Rational? This group kept their booth traffic at a non-stop pace because every one of their chefs was an absolute master of fun! Recipes from The Korean Pavilion. Thanks for sharing! 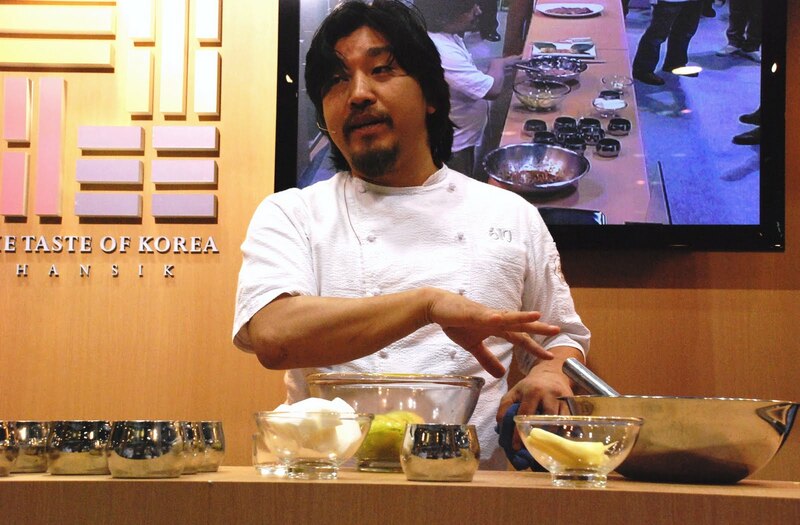 Bringing in 4 celebrity chefs - Bill Kim, Debbie Lee, Edward Lee and Yongja Kim - was such a great blend of talent. Each had their own recipe for bringing home the simplicity and great taste of Korean food. 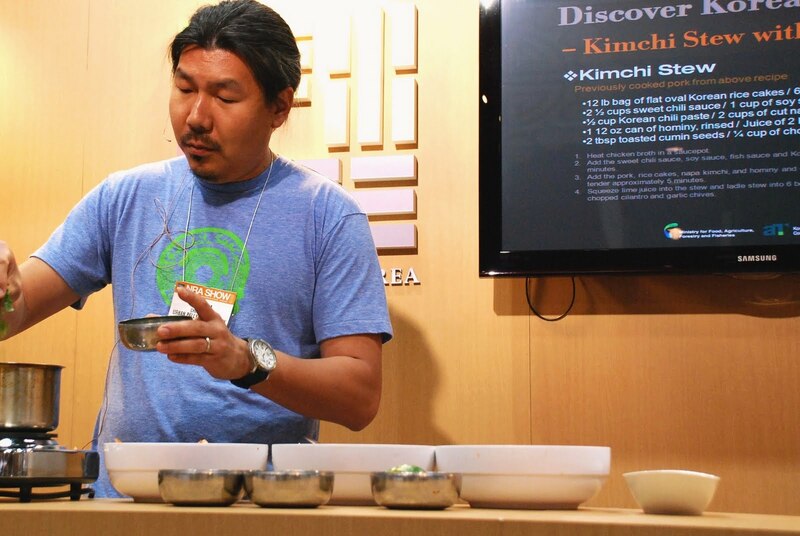 I’ll be making Bill Kim’s Kimchi Stew with Hominy because it was one of my favorite foods of the show. Combine fish sauce, sweet chili sauce, brown sugar, mirin, siracha and chili paste in a big bowl. Pour liquid over the pork until almost completely covered. Cook pork in a preheated 300 degree oven, turning after one hour, for about 2 hours. The pork should be tender and fully cooked. Remove Pork Belly and cool. Once cooled, large dice pork and reserve. Heat chicken broth in a saucepan. Add sweet chili sauce, soy sauce, fish sauce, and Korean chili paste and simmer 5 minutes. Add pork, rice cakes, napa kimchi, and hominy and continue to simmer until rice cake is tender – approximately 5 minutes. Squeeze lime juice into stew and ladle stew into 6 bowl. Garnish with toasted cumin, chopped cilantro and garlic chives. This dish, made by Chef Edward Lee of 610 Magnolia in Kentucky, was also a favorite. I knew that I would like the flavor of the short ribs but the incredible taste of the Green tomato Kimchi really took me by surprise. I plan to make it as a side dish to a lot of my BBQ recipes this summer. Layer your short ribs in a casserole and pour the marinate over each layer making sure every rib is nicely marinated. Cover and refrigerate for 4 hours or overnight. Remove from the refrigerator and let meat get to room temperature. Grill on high for about 2 minutes on each side. Prepare the green tomatoes by slicing them thin and layering them out flat on a sheet tray. Sprinkle on the sea salt and let stand at room temperature for 30 minutes. In a separate bowl, mix the radish, garlic, ginger and chili flakes. Brush off excess salt from the tomato slices and later them in a jar with the radish mixture. Put the vinegar, water, salt and sugar in a small pot and bring to a boil. Once boiling, turn off heat and gently pour the hot mixture into the jar with the tomatoes. If not completely immersed in liquid, top off with water until the tomatoes are completely covered, Put a weight over the top. Close the jar tightly and let marinate in the refrigerator for at least one day. When ready to serve, drain and slice the tomatoes and serve with grilled kalbi. 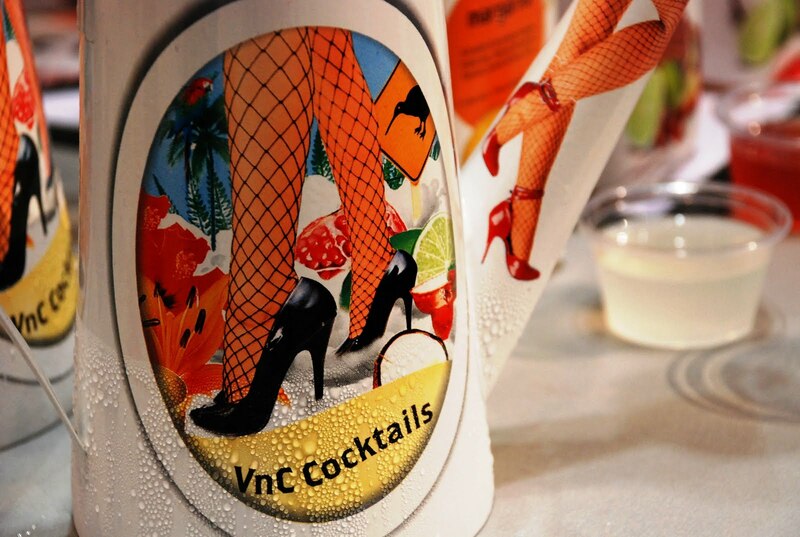 VnC Cocktails - In the past year VnC Cocktails has exploded across New Zealand and their popularity is spreading around the world…soon to be in the U.S, hopefully in time for the pool season this summer.I indulged in their perfect Margarita which I must admit was as good as my own recipe. Other flavors include Strawberry Daiquiri, Vodka Mojito, Banana Daiquiri, Pacific Breeze, and Pomegranate Cosmo. 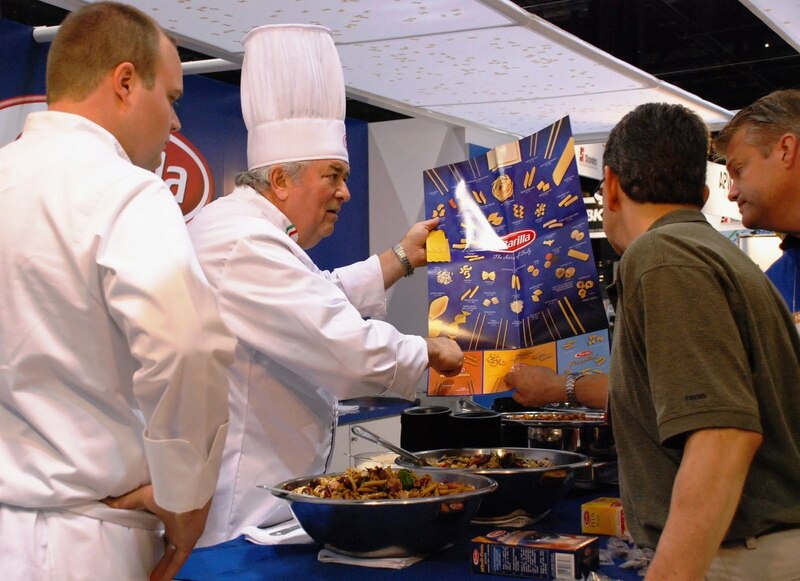 J&J Snack Foods – J&J was a trendy booth with so many new snack items to choose from. 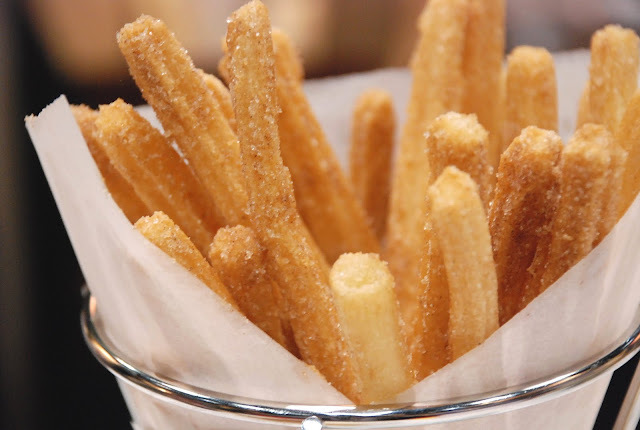 The popluar favorite: TIO PEPE'S® churros. Bing – One of my favorite drinks of the show was the Bing Energy Drink. For anyone who loves cherries, you will LOVE this new beverage. It would also be great as a chaser to an ice cold vodka or lemonade. 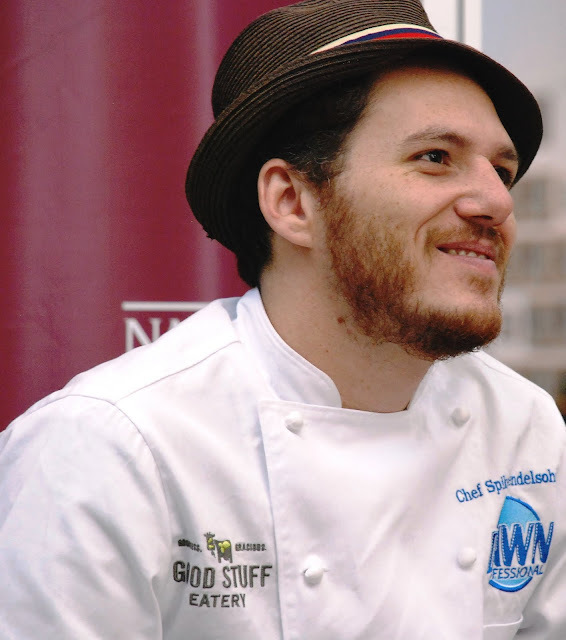 Walters State – I never heard of Walters State until I met Assistant Professor of Culinary Arts, Joe Cairns. With some of his culinary students in tow, this professor took on the NRA Show with so much enthusiasm that I wanted to enroll in his program immediately. Inspiration is just a moment away from knowing that every great wannabe chef has a mentor somewhere and tag - you’re it Professor Joe! Sweet Street – What can I say? Finally in dessert heaven and not sure I want to ever come back. 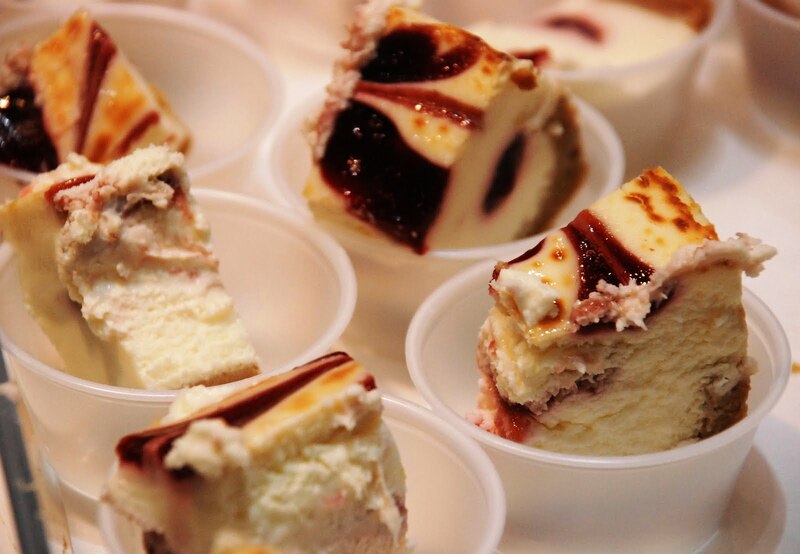 This was everyone’s favorite dessert stop at the show. AM or PM…the flavors were INCREDIBLE! Vienna Beef – With no ketchup allowed (and they yellow stickered everyone with that thought) and a 4-bite sized hot dog, this was one of the hottest stops on the food circuit. Always a long line, this booth had a high-spirited staff who made you feel like your hot dog experience was the MOST important one of their day. 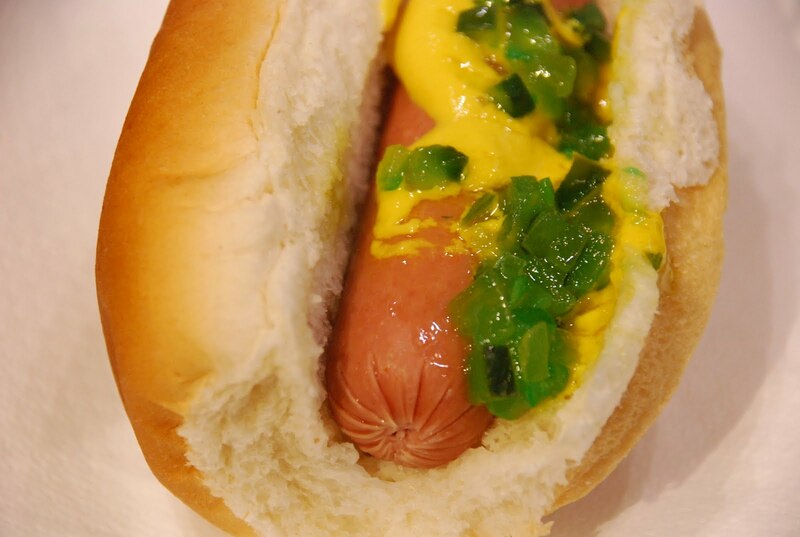 Believe me, I took a taste of every hot dog at the show (my job ) and Vienna Beef is still KING! As a close to another great show, a flash mob of chefs, restaurateurs, students and exhibitors danced in the first-ever restaurant flash mob dance. 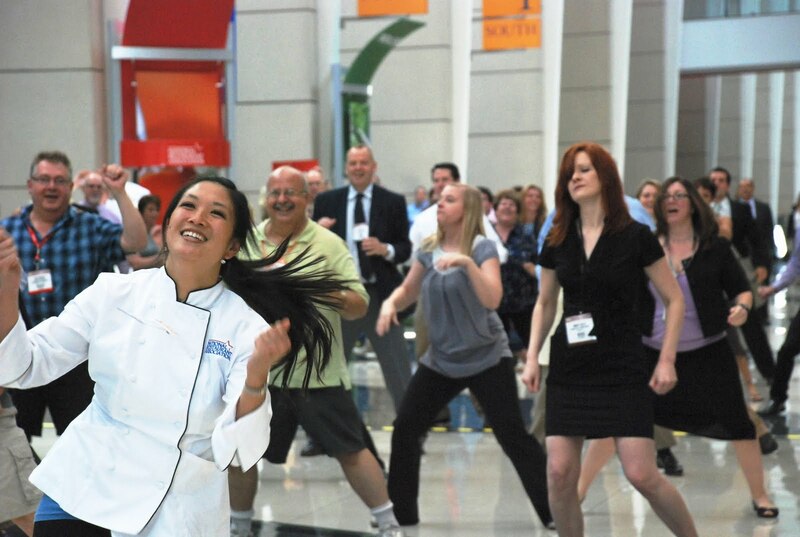 The originally choreographed dance — set to Lady Gaga’s “Just Dance” — was created by dancer Christina Chen of Cerqua Dance Theatre exclusively for the NRA Show and it was a huge hit. See You Next Year and Bon Appetit!